Ok…so, on April 27th I am running the OKC half marathon. There are actually quite a few running the half and full marathon from our church. It’s going to be a great day. I have mentioned that I am running for Trey…my hero. Trey ran a much better spiritual race than I ever will and this physical race is in his honor…and I want to run the physical race like I want to run my spiritual race…with focus, endurance and passion! A very good friend of mine, Alena Foster Honeycutt created a t-shirt design that I plan to wear in the race. I’m grateful for her kindness to me, helping making this day extra special. Several have indicated to me that they would like a shirt. Well, you can see the shirt pictured below and they will be on a bright yellow, Nike dry fit shirt. I plan to go see Carrie Nelson McKellips tomorrow to get pricing. I suspect the shirts will be around $20. However, I had a very generous friend offer to purchase some shirts for those wanting to remember and honor Trey. 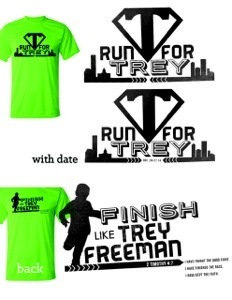 I would like most of these shirts to go to those actually running in the race, but I would also be honored by others getting a shirt to wear in memory and in honor of Trey. Below is the t-shirt design…the silhouette is actually from a picture of Trey running. I love it! Thanks Alena! The top picture is of the front and the bottom picture is of the back. I haven’t decide which front version I will use…I’m trying to decide whether or not to use the date (you will see both options below)…and the city skyline on the shirt, by the way, is of OKC! If you want a shirt, send an email to jeremy@fbcnewcastle.com and give me your name, shirt size (remember, they will be Nike dry fit), and phone number (so I can contact you if I need to). If you live out of town, send me your address too and I will figure out a way to ship it to you. I need to order by next week, so get me your information by Thursday, April 3rd at the very latest. This will be first come first serve and when the freebies run out, if you want one it will be around $20 (I’ll confirm the price tomorrow).